I hadn’t even really done much research, I just kind of showed up, unsure of what to order. That problem was quickly resolved when I found out there is only one item on the menu. You can get extra things, but what you order is Chicken and Rice. It’s a poached chicken that is incredibly moist and flavorful. One reason I rarely eat chicken is because it can be dry. Not here! The rice gets added flavor from being cooked in the liquid the chicken was poached in. 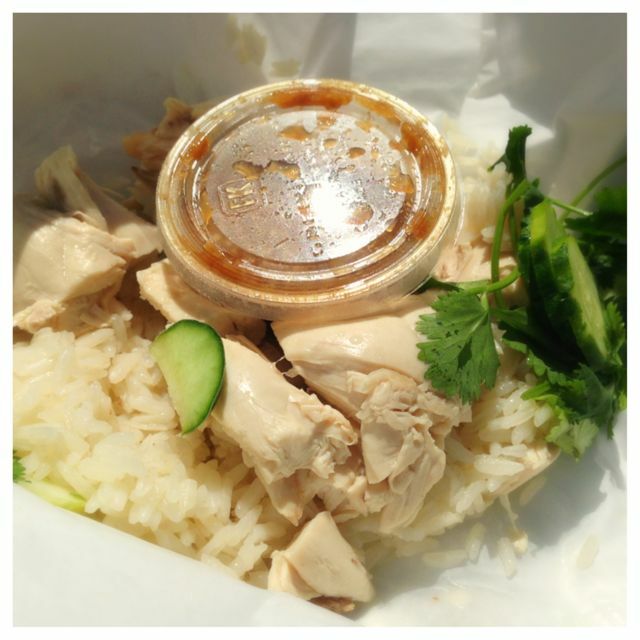 I was pleasantly surprised to see that the chicken and rice is wrapped in paper. You unfold and pour on your sauce and eat. Talk about food on the go, they have got that down. I was told to get some fried chicken skin. I wasn’t so sure what I thought about that. The guy said that they had already run out those by noon and that most people call in and have theirs saved to make sure they get them. So I guess for now, I won’t know if they are any good or not. Please let me know if you have had them and what exactly they are. Apparently they are a hot commodity. I should also note that she also sells her special sauce that she uses. Check out her site for all the information. Looks like it can also be purchased at Tails and Trotters and Zupans. Atmosphere at this pod is very busy and bustling. I did like that not far away is a little park to sit and eat. Pricing is very reasonable at $7. I should note it also comes with a broth soup and some veggies. Services here is a treat. They guy has a great personality and I understand that he’s great at remembering faces and names. Gotta love that! They offer all kinds of drinks, juices and even Thai iced tea. 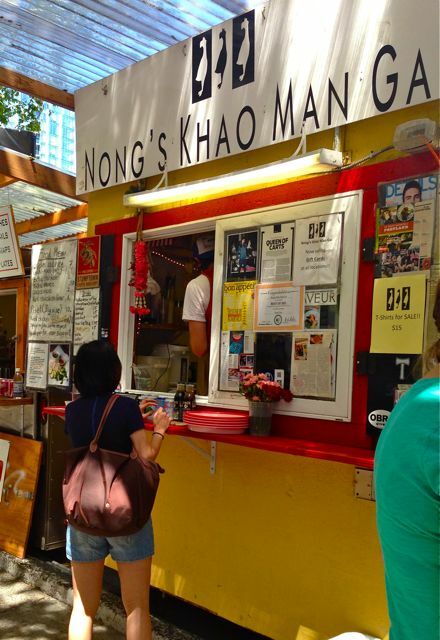 Nong’s Khao Man Gai is located on 10th & Alder.